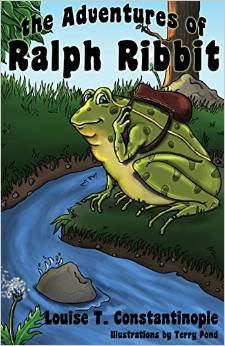 “The Adventures of Ralph Ribbit” is an exciting, illustrated chapter book for readers age 8 and up. The story traces an exciting journey upstream for Ralph Ribbit, a frog father who is attempting to pick up shirts for the Muddyville Middle School track team, which his son Reggie is a part of. Unfortunately, Ralph has lost the map to locate the shirts upstream at a store called Leaps and Bounds, and he is in a dreadful hurry! Kids will trace Ralph’s journey and adventures along the way, which include meeting not one but two rattlesnakes, who normally consider frog a delicious meal. How Ralph survives this and other interesting dilemmas and delays is a highly entertaining reading, and the comical black and white illustrations keep imaginations involved and interest high. “The Adventures of Ralph Ribbit” contains lots of gentle humor, caring attentions from adults and children (frogs), and lots of parallels for creative ways to tackle unlikely but predictable daily problems and dilemmas.